Making machining manufacturing even easier, helping our clients to find approp­riate tool solutions which meet their specific needs, offering fast and easy order processing as well as quick, low cost ship­ping, that means good service for us. That is what we are working for. For which technical application is which tool best, for which special requirement which solution right? Do you have questions about deliveries, orders or inventories? Contact us with your questions! - We are there for you by phone, fax and e-mail. Service times are Monday to Thursday from 8 am to 5 pm, Friday from 8 am to 4:30 pm (not on public holidays). make also use of our Callback Service, to have us call you back for free on a preferred time! Or send us your request with our Contact-Form. Beside a high level of products availability, you can always rely on IBT THIERMANN for fast processing and fast shipping. Also in your individual tool requirements, IBT THIERMANN can support you, looking together with you or according to your specifications for a solution, that can be realized rapidly and practically. - If you wish a proposal it is best to send us a drawing of your tooling. Online IBT Thiermann is there for you 24/7 with all informations about our entire range of tools and services. 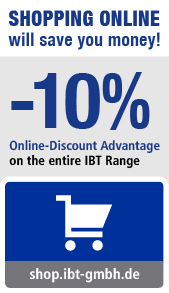 And in our IBT Online Shop you can purchase IBT products right on the spot. - Order here regardless of time and place and benefit in addition from our 10% Online-Advantage Discount* on all our products! *Online-Advantage Discount only for online orders. Cannot be combined with other offers/discounts. I B T - always NEAR you! Through our network of technical dealers, almost all products from the IBT range are available in your area. Nearby dealers will show you our IBT Dealer Searchtool. If you no longer wish to receive our newsletter, you can either click on the "Unsubscribe" option at the end of any newsletter. If you have any ques­tions please do not hesitate to contact us!